In WordPress, you can add Post Thumbnails in very easy way. Some WordPress Theme has this Post Thumbnails feature enabled by default. However, the Post Thumbnails are just images, if you mouse over, they will show the image alt but by default, Post Thumbnails are not linked to the posts. After reading this tutorial, you will be able to Link Post Thumbnails to the Posts directly. You can link Post Thumbnails to the Post Permalink in a specific loop or you can link all the Post Thumbnails on your WordPress Blog to the Post Permalink. Do not use both methods together to link post thumbnails. Thanks to WordPress Codex for the Link Post Thumbnails Function Reference. This Article Has Been Shared 5789 Times! A gravatar is a miniaturized image that is associated with an e-mail.This feature is a way to brighten up the look of your blog but also to identify you. 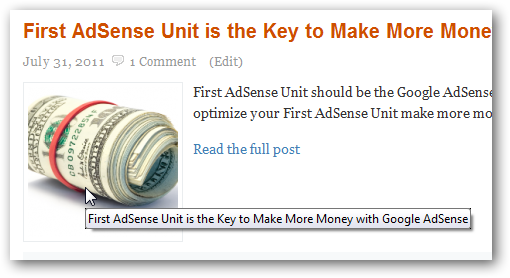 For many, selling links is a very popular technique for making money with a blog or website. Here are some tips on selling links. Common Mistakes in Blog Design are not infrequent and if corrected can increase both the conversion rate and indirectly increase your AdSense revenue. Website Stats With Real Time Visitor Analysis is possible using a nice feature of Google Analytics. Here is how to get website Stats With Real Time Visitor numbers. Cite this article as: Abhishek Ghosh, "Link Post Thumbnails to the Post Permalink in WordPress," in The Customize Windows, August 2, 2011, April 25, 2019, https://thecustomizewindows.com/2011/08/link-post-thumbnails-to-the-post-permalink-in-wordpress/.